ONE of the crucial transitions of modern health care was from herbal to chemical medicine. Doctors had known for millennia that willow bark and poppy sap relieve pain. But it was not until the late 19th century, when Felix Hoffman synthesised versions of their active ingredients, namely acetylsalicylic acid and diamorphine (or aspirin and heroin, as they are more commonly known), that proper pharmaceutical science got going. Just possibly, something similar is happening now. The past few years have shown that having good relations with the 100 trillion bacteria which inhabit the gut is essential to human health. If relations break down, hostile bacteria may invade and previously friendly ones may turn hostile. When things do go wrong, though, doses of corrective bacteria can make a difference. These may be administered orally, in foodstuffs such as yogurt, or (and those of a nervous disposition should look away now) anally, via transplants of faeces from healthy people. Some doctors, however, see these approaches as the equivalent of decoctions of willow bark and tinctures of opium. They would like to put the whole idea on a more scientific footing, and two groups of them have just published papers that are steps on the road to doing so. 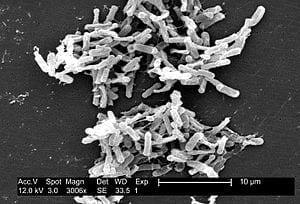 Trevor Lawley and his colleagues at the Wellcome Trust Sanger Institute, near Cambridge, hope to replace faecal transplants as a way of dealing with a bug calledClostridium difficile. This is a particular scourge of those being treated in hospital with oral antibiotics that, as a side-effect, kill many gut microbes and thus let C. difficile run wild. Faecal transplants are effective, but Dr Lawley wanted both to understand why they work and to see if a more tailored version of the treatment might be possible.